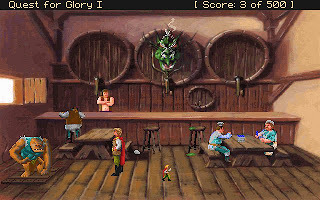 Quest for Glory was first released in 1989 and was re-released in 1992 for the VGA version. 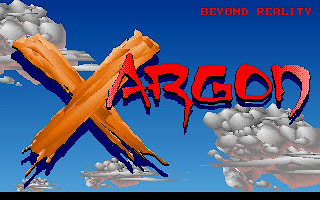 The VGA version also support Sound Blaster to produce some digitized sound. 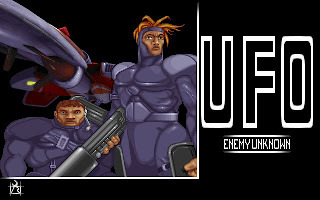 The remake also support point-and-click system that make the game play a lot easier than the original release. 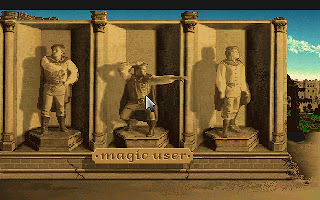 The game advertised itself as "three games in one" since it was the first Sierra game that allowed the selection of a character out of three classes: Fighter, Magic User, and Thief. The class will determines how we can solve puzzles and what quests we will run into. 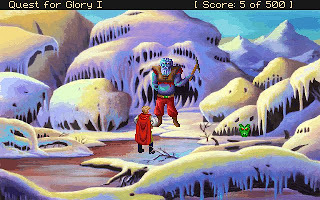 Since Quest for Glory has the RPG elements, the concept of day, night and the passage of time was introduces. The setting and scenery was different during day and night. We also had to eat on a regular basis, and would become tired from running and fighting which required rest and sleep. Skills were not obtained by gaining levels through combat, but rather increased distinctly through the regular course of our adventure. The more we use magic, the more our Magic ability would increase (followed by Intelligence); likewise the more we engaged in battle, training, or even cleaning the baron's stables, the more our Strength, Vitality and Agility would increase. 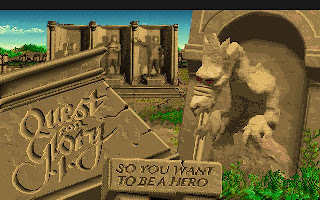 The thing I hate most about Quest for Glory is some parts are too time-consuming. For example, in order to build a certain skill or reach a certain point of time, we have to repeat for countless times some certain action (such as 'climb tree' to develop Climbing, 'get rock'-'throw rock' to develop Throwing etc), or walk aimlessly until the time passes. Really annoying actually! One thing I notice in Quest for Glory I is we seldom speak. 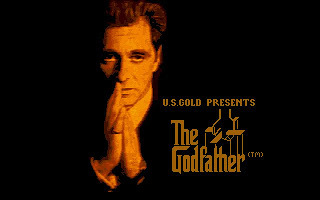 We hardly speak one line in the whole game. When we ask people questions, we just select the title of the questions and the NPC will answer us immediately. Some kind of mind reading should be. 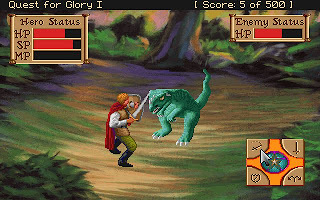 To fulfill the promise of RPG/Adventure hybrid, we will engage combat with various kind of enemies occasionally. The combat is pretty simple, but at least there are still some fun in playing it. 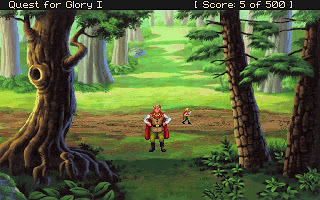 Overall, Quest for Glory I is a nice adventure game. If it is not, it won't have 5 instalments in the series right? 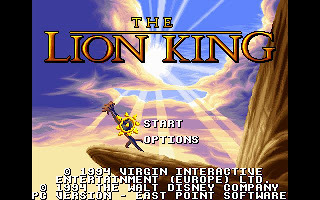 You can download Quest for Glory with its manual and walkthrough here.